The SecureAX Disaster Recovery as a Service (DRaaS) offering places a high emphasis on maximising infrastructure’s availability for our customers in Singapore & Thailand. In addition to robust WAN made available through our datacenter, we are able to provide business leased line or MPLS connectivity to link up our customers’ on-premise or off-premise main datacenter with our disaster recovery (DR) datacenter, thereby enabling us to maximise our Disaster Recovery (DR) Management through this private circuit arrangement. 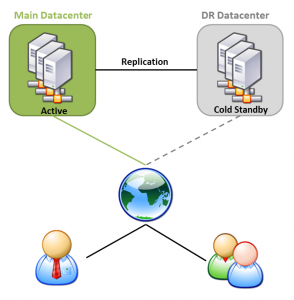 How does SecureAX Disaster Recovery Service work? Our Disaster Recovery Management service typically involves reviewing our customer’s present primary site setup and identifying the potential risks faced by the customer. By understanding the customer’s business operations, we will next propose a disaster recovery setup that would be the most cost efficient to the customer and begin commissioning the disaster recovery (DR) site. The DR site then actively replicates data from the main site. Should the main site goes down, the traffic shall be taken over by the DR site which can be activated automatically or upon confirmation by our customers. Annual disaster recovery readiness drill test and disaster recovery audit checks shall be performed with the customer in ensuring the business continuity during an unlikely incident. It should be noted that whilst most of our disaster recovery site customers are Small Medium Enterprises (SME) and Multi National Companies (MNCs) operating on their primary site within Singapore & Thailand, we have recognised the importance of supporting our regional customers whose primary datacenter could be in Malaysia, Indonesia, Australia, Hong Kong, China and Japan. Therefore, our Disaster Recovery service also covers full hardware management, acting on these customers’ capacity in managing and maintaining their hardwares in our disaster recovery datacenters in Singapore & Thailand. B201 Soi Phutthabucha 2, Phutthabucha Rd. Bangmod, Sub district Jomthong District, Bangkok 10150, Thailand.